Looking for space to tuck a powder room (or half bath) into your already cramped for space home? There is a new product that might be the answer for you, but you will have to think outside the box a bit. Caroma (www.caromausa.com) has introduced a unique fixture that integrates a dual flush toilet and a sink basin into a singular unit. This all-in-one fixture offers an environmental (water re-use) benefit to boot. After the toilet is used clean, fresh water is fed through the integrated hand-washing faucet instead of flowing straight down the drain (literally) like conventional toilets. The handwashing water is collected in the toilet tank where it is stored for the next flush. Though slightly unconventional, the fixture offers a couple key benefits worth considering; 1) it is environmentally conscious, which is never a bad thing. 2) It allows for a very compact footprint and greater flexibility when locating a powder room. 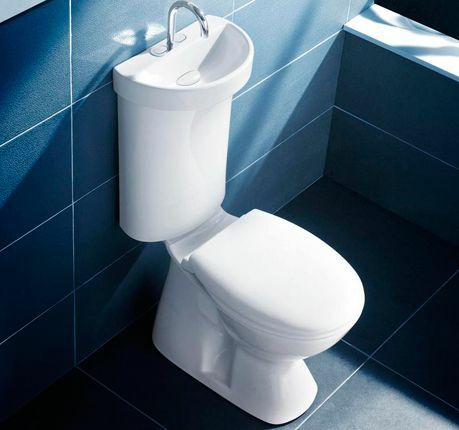 3) Cost of all-in-one unit is offset by reduced installation cost since singular water and drain connections serve both toilet and sink functions. On top of that, it is bound to become a conversation piece for all visitors. At Pagenstecher GROUP, we are constantly on the lookout for the newest products and innovations in residential design and construction. If you are considering a home renovation project in Maryland, DC or Virginia, let our experts develop a unique design solution for you.